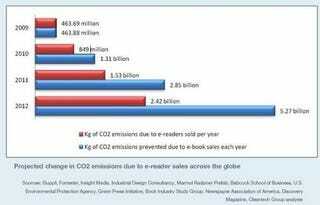 According to an analysis by the Cleantech Group, the Kindle is more environmentally friendly than plain ol' paper books, assuming you're not a freak who reads less than five books a year. We found the "fullest capacity" of the Kindle a bit amusing. Sure, the study compares the number of books you can have on a Kindle at a given moment, but what about the infinite number of deletions, downloads, and books stored on your computer for syncing?